The bar chart below shows the percentage of unemployed graduates, aged 20-24, in one European country over a two-year period. Many people assume that the goal of every country should be to produce more materials and goods. To what extent do you agree or disagree that constantly increasing production is an appropriate goal? 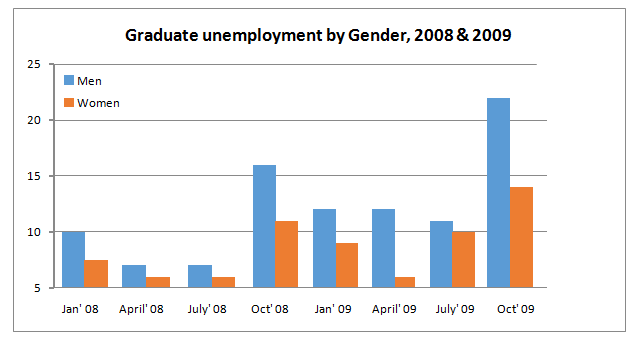 Firstly, generally speaking, graduate unemployment rose for both groups from 2008 to 2009. Although women's unemployment levels were the same for April 2008, July 2008 and April 2009, all other figures rose. Secondly, there was generally more unemployment for both genders during the autumn and winter months, with figures for both genders peaking in October (e.g. for males: 16 percent in October 2008 and 22 percent October 2009). Perhaps the most striking trend, though, is for a greater percentage of male than female graduates to be out of work at all times of the year. Also there is greater seasonal variation for men than women: the gender difference is much more marked in October of both years and this reaches a peak in October 2009, where there is an eight percent difference between women and men. Finally, employment of women graduates is relatively stable throughout the whole two-year period. It only varies by eight percent (six percent in April 2008, to 14 percent in October 2009). By contrast, men's unemployment fluctuates more noticeably, with a range from eight to 22 percent. It is thought by a majority of people that, to enhance the manufacturing of various things should be the major goal of countries. Since it results in both blessings and curse to human kind; this essay aims to find the controversial issues related to augmentation of production. It can be stated undoubtedly that, a country can never soar its development without boosting its material production. Moreover, to meet the demands of ever growing population it needs to produce goods related to basic needs as food, clothing etc. Third world countries especially the least developed countries always feel such pressure. Besides this, in order to alleviate poverty from country there is a constant stress of enhancing GDP which in turn demands for continuous production. Every nation wants to keep them abreast with the flow of globalization, hence tend to manufacture more and more materials. If excess local product can be exported for example, foreign currency will be obtained and thus countries can catch the global market. However, tendency to increase production may cause negative consequences. When a country is in the mode of boosting market, it may often unaware of environmental soundness. More factories means more wastes and if such wastes cannot be managed carefully and properly, great havoc may occur such as air pollution, water pollution etc. Additionally it is irony that high production does not always suppose to eliminate scarcity of people until the yields are properly distributed. Lastly, the principle of long term development lies on the effective and efficient utilization of resources, not in unwise surge of production. It can be concluded that, to cope with the modern era, countries have to emphasize on producing more products. But they should also think prudentially that such production must be sustainable and eco- friendly.